June 28, 2017 By Denny Hansen & filed under All Articles, Handguns, Weapons. 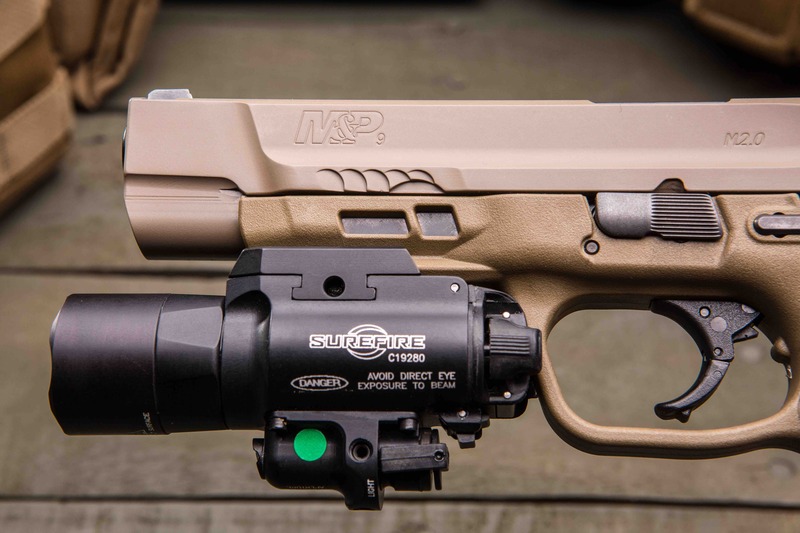 Smith & Wesson M&P M2.0 is a serious pistol for serious users. 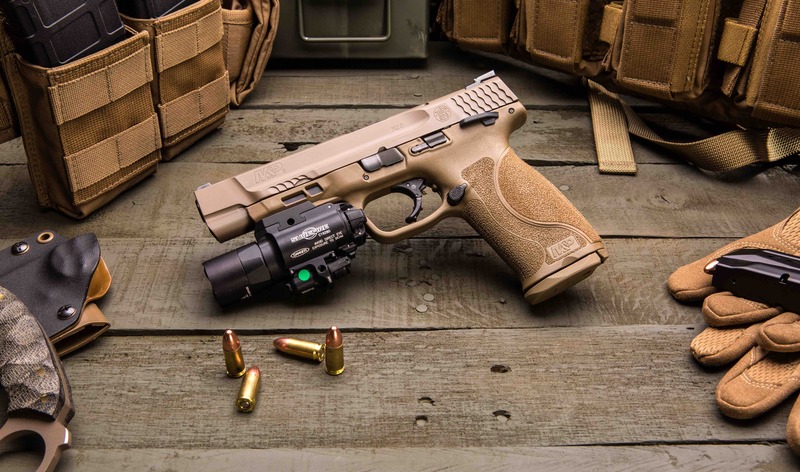 Although it doesn’t seem that long ago, it has been more than ten years since Smith & Wesson introduced the M&P® (Military & Police) pistol line, which includes full size, compact, and the popular Shield pistols. The S&W M&P is issued by many agencies, including the Maricopa County, Arizona, Sheriff’s Office (MCSO). Maricopa County is the fifth largest county in the United States. Encompassing 9,226 square miles, it is actually larger than four states. MCSO is the third largest sheriff’s office in the country. MCSO employs 3,300 people (sworn, detention, and civilian). With a budget of $353.4 million, they have the resources to choose whichever pistol they feel is best for their needs—and they chose the M&P as their issue pistol. Incidentally, the Shield is MCSO’s only officially authorized off-duty gun. In January, S&W introduced the latest pistol to the M&P line—the M&P M2.0™ pistol. Right side shows ambidextrous safety and slide lock. Magazine release is reversible. 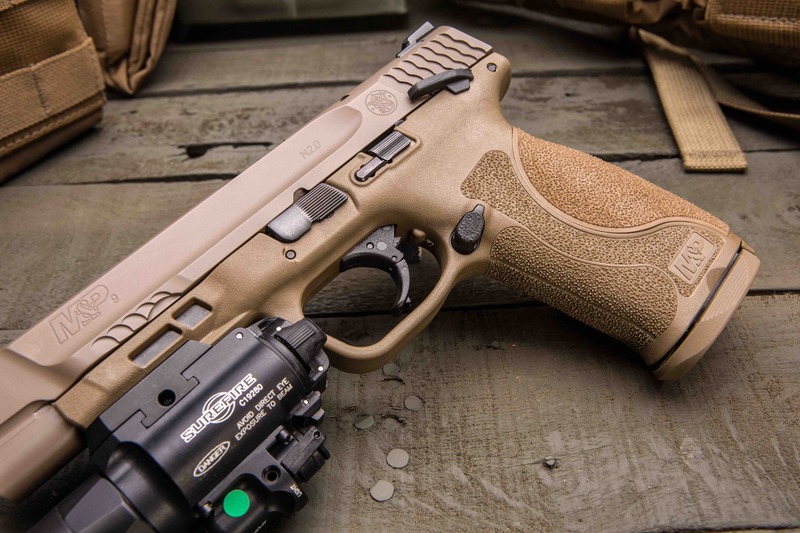 Though based on the previous M&P pistols, the new M2.0 is an entirely new platform, with innovative features in nearly every aspect, including the trigger, grip, frame, and finish. The pistols have an extended rigid embedded stainless steel chassis to reduce flex and torque when firing. There are a total of eight different versions in three calibers, including a full-size .45 ACP with no external safety or ambidextrous thumb safeties, full-size 9mm with no safety or ambidextrous thumb safeties, and full-size .40 S&W with no safety or ambidextrous thumb safeties. The above all have a 4.35-inch barrel and Armornite® finish (a hardened nitride, corrosion-resistant finish). The last two versions—a 9mm and a .40 S&W—have a 5-inch barrel, are .90 inch longer than the other six pistols, and are available only with ambidextrous thumb safeties. They have the Armornite finish on the barrel and slide. 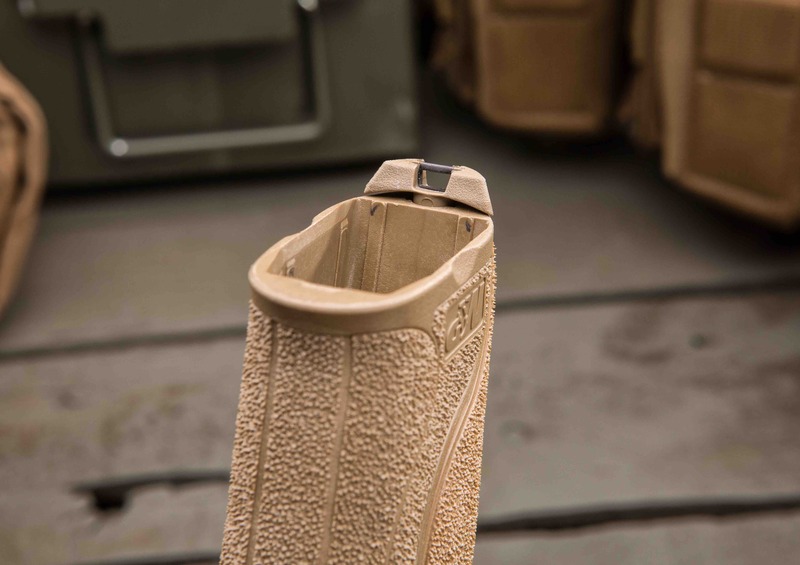 The slide has a Cerakote® Flat Dark Earth finish over the Armornite on Flat Dark Earth M2.0 slides. M2.0 comes with four backstraps: S, M, ML, and L to fit a wide range of hand sizes. All models have ambidextrous slide stops and a reversible magazine release. The pistol tested here was the five-inch 9mm model (SKU: 11537). The M2.0 has a more aggressive textured grip than previous M&Ps for enhanced control. 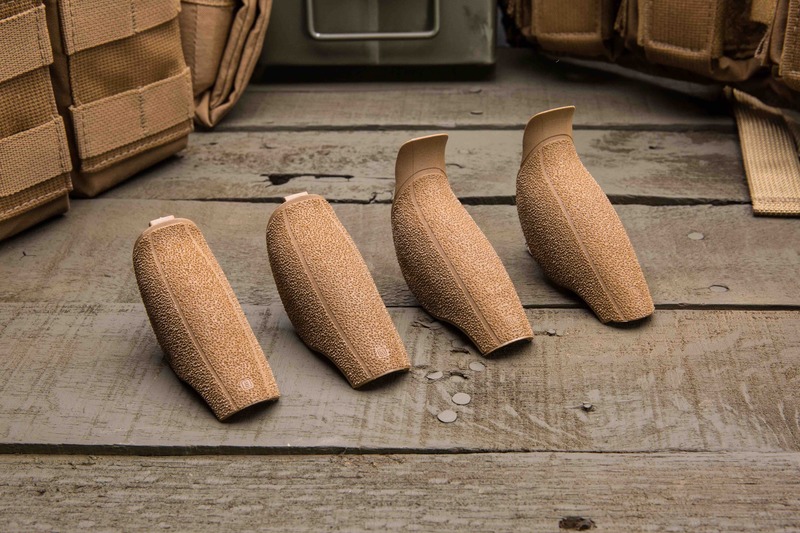 While several manufacturers offer three interchangeable palm swell grips, the M2.0 has four—S, M, ML, and L—to offer a better fit for a wider range of shooters. The M2.0 has low-profile cocking serrations placed at the bottom of the slide vice across the entire slide. They help the M2.0 maintain a sleek look. The dust cover has a rail for attaching a light or laser. Sights are of the three white dot type. The pistol has an overall length of 8.3 inches and weighs 26.9 ounces empty. It can be disassembled without pulling the trigger. It arrives in a hard-sided fitted case, with two 17-round magazines, manual, and cable lock. 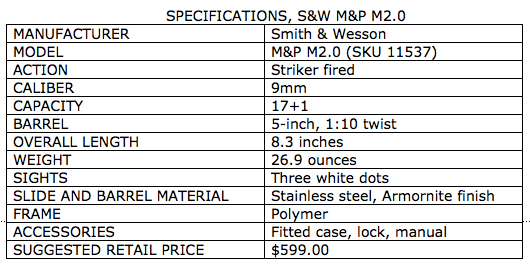 Magazines are compatible with previous M&P mags—a good call on Smith & Wesson’s part. Although bottom of frame has small scallops for removing a stuck magazine, author prefers Vickers Tactical Magazine Floor Plates from TangoDown for sure extraction. Dimples on baseplates can be filled in with a marker or paint pen to number them. I tested the M2.0 with an Off The Grid Concepts Nocturnal Sidewinder Holster and Adaptive Speed Pouch (LAWFUL CARRY: Off The Grid Concepts, May 2017 S.W.A.T.). My older M&P clicked securely into place and retained the pistol even while shaking it up and down. 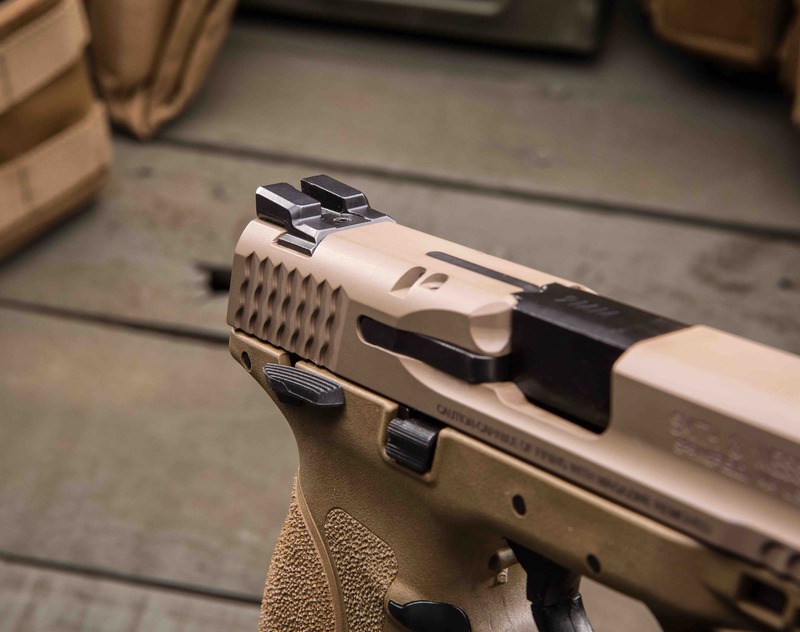 Although the longer slide of the test pistol did not allow it to be fully holstered, the precise molding let it hang onto the SureFire X400 Ultra and withstood the same shake test. You can’t shoot what you can’t identify, and when it comes to weapon-mounted lights, my first choice is SureFire. 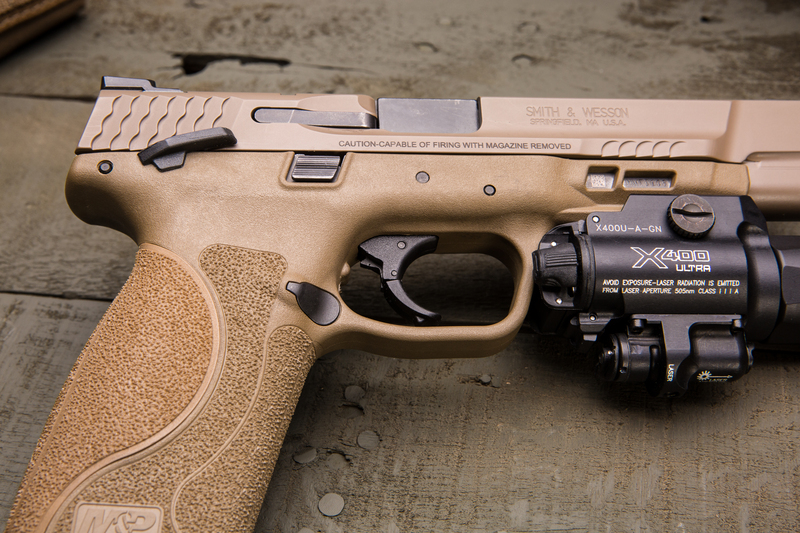 The SureFire X400 Ultra is the latest pistol weaponlight from the esteemed company. The X400-GN produces 600 lumens of blinding white light and has a built-in green laser (a version with red laser is also available). In my opinion, a green laser is vastly superior to red for two major reasons. M2.0 has lanyard loop incorporated into takedown tool. First, green is the color most easily seen by the human eye. Second, and possibly more important, not all encounters occur in the low-light environment where a red laser is best seen. Green can be seen outdoors on all but the brightest day. I changed the floor plates on my personal M&P mags to the Vickers Tactical Magazine Floor Plates from TangoDown. These floor plates are flared slightly at the bottom with non-slip grooves, making extraction of a stubborn magazine effortless. They also work well with one-handed reload of a stuck mag by placing the flare under your belt. Dimples in the floor plates allow them to be marked/numbered. Pleased with how these floor plates have worked for me in the past on my personal M&P, I installed them on the test pistol’s magazines. 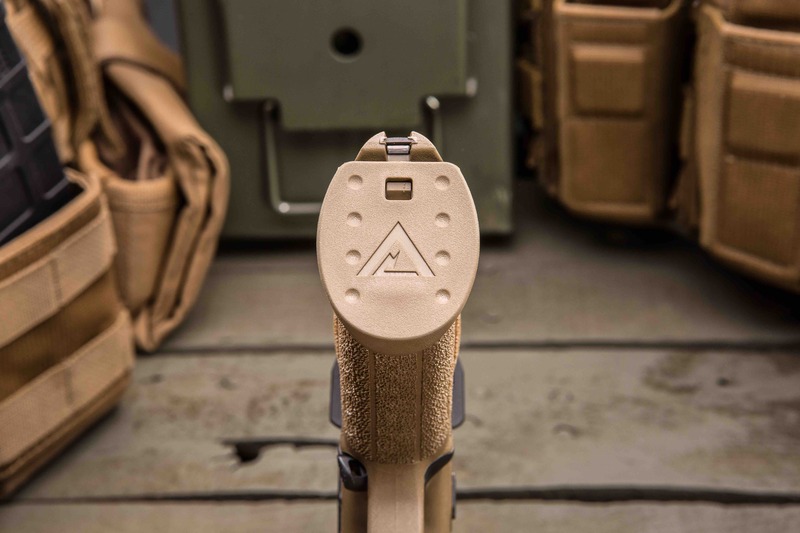 Front face of rear sight is flat, for ease of one-handed manipulation. I begin each evaluation by pulling an Otis Ripcord down the bore to remove any particles or oil that may have been left behind during manufacturing, then I lubricate the firearm. Firearms are a lot like people when it comes to liking what they’re fed. Shotguns are the pickiest, but handguns and rifles can be as well. Compounding the situation is that all brands of ammunition may not be available in a given area. With that in mind, I arrived at the range with 28 factory loads and one handload. Loads ranged from 80-grain screamers to 147-grain subsonic loads. I began by firing 20-round strings of each load over the screens of my PACT Professional Chronograph to establish average velocity of each load. Left side of MP2.0 shows mag release, safety, slide lock, and takedown lever. Only takedown lever is not reversible/ambidextrous. At this point in the evaluation, problems occurred with two loads. 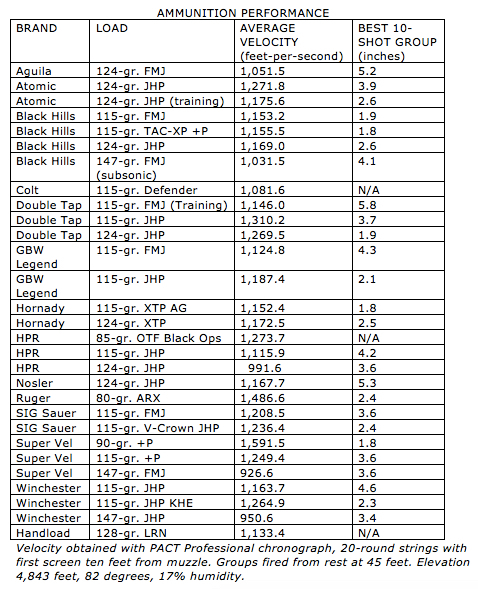 Both the Colt Defender and HPR Black Ops would not function the pistol. The HPR Black Ops completely failed to cycle all 20 rounds in the chronograph test. The Colt load had stove pipes on 18 out of 20 rounds, and the two that ejected literally dribbled out and landed on my hand. Since they failed to function, they were not included in the accuracy tests. Next, I fired ten-round strings of each load for accuracy from a rest at 15 yards. Top honors in velocity went to the Super Vel 90-gr. load and tied for first in accuracy along with the Black Hills and Hornady 115-gr. JHPs. The complete results can be found in the accompanying table. While I enjoy shooting, this part of the evaluation is always somewhat tedious and methodical, and in this instance took the better part of a day. Low-profile cocking serrations, placed at bottom of slide vice across entire slide, help M2.0 maintain a sleek look. Obviously I had not run the M2.0 very hard yet, with the shooting being slow-fire, aimed shots. On a second trip to my range, it was time to get in meaningful practice—and some fun. Starting at 25 yards, I did some shooting on the move, firing two to three rounds, pausing and starting again every five yards. By the time I reached the ten-yard line, I was firing hammers and, closing from five yards to near point of contact, I shot NSRs (non-standard responses) of four to six rounds. Movement drills continued, with stepping off the line of attack while moving laterally, and backward while engaging the target from the holster. For headshots, I put several “no shoot” targets to the sides and behind the target to be engaged, simulating a crowded area. While still moving, this forced me to apply Rule 4 (be aware of your target and what’s behind it). In this drill, I also placed a small balloon on the “shoot” target’s head, because while a headshot on a static piece of paper is pretty easy, one that bobs and weaves is harder and more realistic. 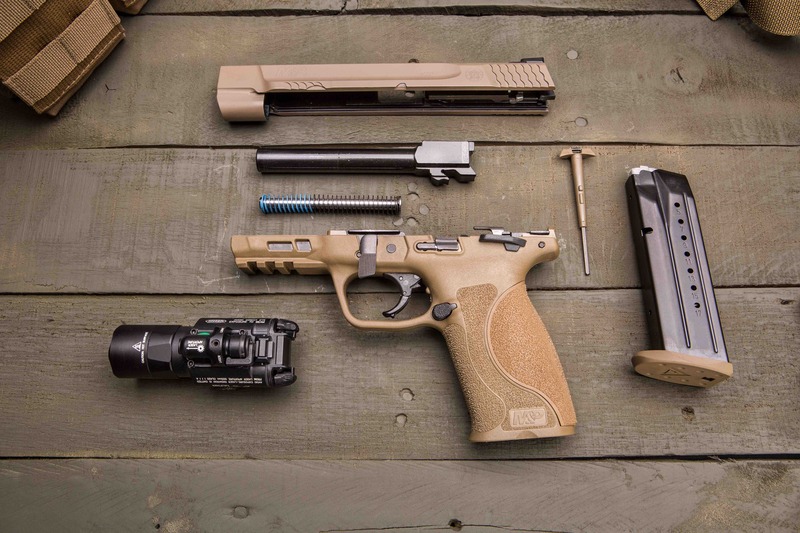 M&P M2.0 disassembles easily without tools and without having to pull the trigger. On the second day, I purposely started late in the day to get in some low-light shooting with the SureFire X400 Ultra. Between the bright light and the laser, hits were fast and positive. The M2.0 allows a high, close-to-bore axis grip for faster shot-to-shot times. Trigger reset is positive and can be heard and felt. Comparing the trigger to my personal M&P with a Lyman electronic trigger gauge, both broke cleanly and consistently at 5.1 pounds. I shoot and carry my 1911s a lot and, since the M&P has the same approximate 18-degree grip angle, it came up on target and pointed naturally for me. In contrast, the grip angle of the Glock is about 22 degrees, and for me it always points high. While subjective, I personally think Browning (and Smith & Wesson) got it right. By the end of the evaluation, I had put just under 1,000 rounds through the M2.0, with no malfunctions except as noted above. Stay tuned for other new product additions and line extensions from Smith & Wesson this year. They will establish a new family based on this platform. If they’re anything like the new M2.0, the shooting community has a lot to look forward to.